City Hall Plaza, Boston. View other Skywatch Friday photos. what a nice blog you have, your photos are beautiful. A stunner once again. Shot in a great perspective. Wonderful shot! There is so much to see and the sky is awesome. 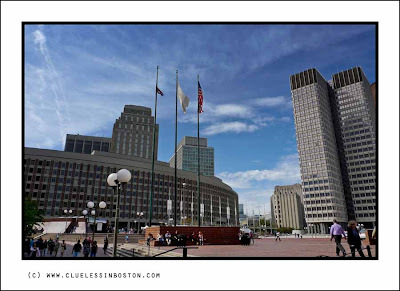 Fantastic shot of downtown Boston, love the architecture and the blue sky above. Classic Boston. Speaking of classic(al) Boston, LOVED the theme day photo. Glad to learn of the young conductor! If one could read skies, that one would have a lot to say, I think. Beautiful. Adorable blue sky dear friend, good job! Always amazed by the amount of space around the building. A very nice lesson in geometry. I love spaces like this, beautiful place, great image. i like your photos alot. i live out by the cape and i don't find myself in town very often. your glimpses leave me wanting to make my way in someday.